Is Samsung’s S5 really Impresses You ? The Galaxy range S5 companies most awaited Flagship Of the year . The Galaxy S5’s design is a minor evolution of the Galaxy S4 — in fact, the two are almost indistinguishable from the front. The S5’s display is ever so slightly larger at 5.1 inches, but it’s still a 1080p, Super AMOLED panel that doesn’t look very different from the S4’s screen. Below the display is a new home key with integrated fingerprint scanner and capacitive keys for multitasking and Android’s back button. Something About S4 : It has got some unnecessary technology that is not used by most of the users (it was just fine not that gud ) just like smart pause, smart scroll etc . But this time they ditched all things with this one they just wanted to make it as Soon As possible official – and it’s not what we expected . Are they lacking Innovation or Is it Rivalary in the Market i think this may be the reason they had their unpacked event at MWC earliest Which was not expected , Or may be to Draw the attention From the Crowd not For the Innovation But to Cheer Up for their Flagship . As being the Top smartphone maker they Should have taken some Step for making Perfect innovative technology(Which they really lack) . This is Something they should learn from APPLE INC . (The Perfectionist ) if they Do things the just make it perfect not unncesaary technology this is why they are the best . I am not a crazy Fan of apple but i do Love this quality in them they just don’t unncessarily Increase the SIZE or the RAM Or CPU .They Also make Changes But Innnovatively . They Do things but what people uses moslty and don’t care inside it (not everyone is a tech nerd) . They just want the phone Not some Octa Core CPU and GPU . Though the S5 is extremely familiar-looking from the front, things take a turn around back, where Samsung has replaced the S4’s slimy, glossy plastic battery cover with a dimpled soft-touch finish. The company is calling this a “modern glam” look, though if you’re familiar with the original Nexus 7 released in 2012, it’s very similar to that. The new back offers a significant upgrade in they way the device feels — it’s much more comfortable to hold and doesn’t slide off of surfaces nearly as much as the S4 — but it doesn’t look as tacky as the fake-leather patterns used on Samsung’s Note line of devices. 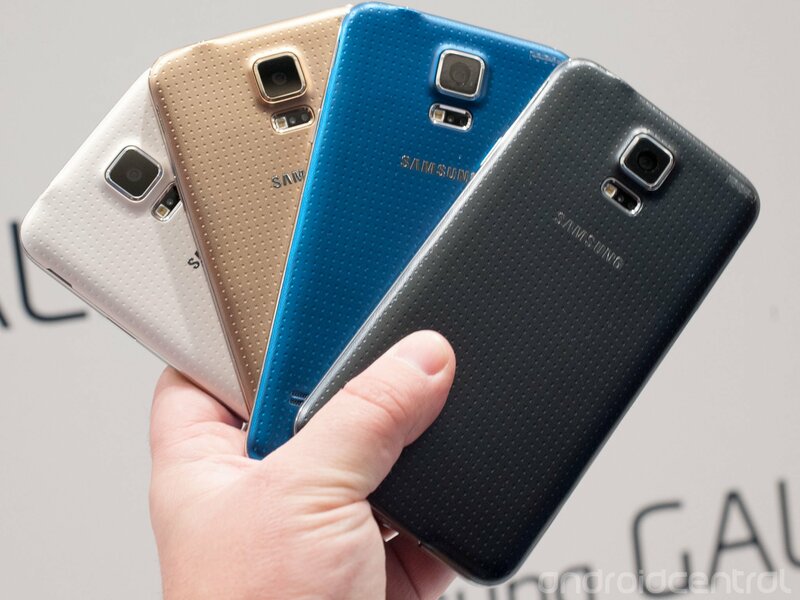 Samsung is offering the S5 in four different colors — black, white, blue, and gold — but the black and white are the most attractive options. The first complaint usually levied at Samsung’s Galaxy smartphones is their abundant use of glossy, cheap feeling plastic, but the S5’s new finish reverses this trend and is one of the most significant upgrades introduced this year. Samsung is making a huge push into the fitness tracking this year and the galaxy S5 gets the really a revamped S health app and new Heart rate sensor on its Back will be really interesting to see when we get our hands on this device . World’s top smartphone company making the copy of as the apple do in their iphone 5S finger print unlocker which is used to unlock the phone can be used to buy apps But is Suckz Samsung’s version requires a vertical swipe over the home button to activate the scanner, and we found it to be quite unreliable and virtually impossible to activate when holding the phone in one hand. It can store up to three different digits, but it was very particular about the speed and orientation of the swiping motion used — if we weren’t doing a perfectly straight swipe down, it would refuse to unlock the phone.